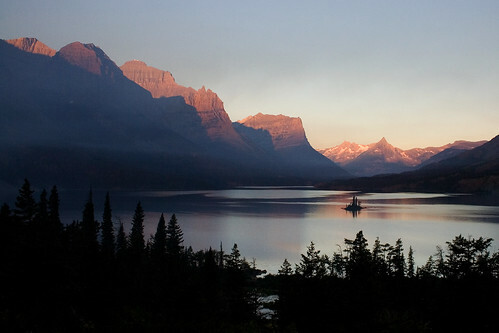 Tiny Wild Goose Island rises out of Saint Mary Lake, as the sunrise illuminates the mountains. Our last morning in Glacier, we decided to take the Going-to-the-Sun Road through the park on our way back to Missoula and our flight home. The forest fire had partially closed the main highway around the park, and with the detour it would take us about as long either way, so we choose the more scenic route. One thing I hadn’t planned on was thick smoke from the fire. The smoke hung in the valley over night, and the first part of the drive was like driving through thick fog that smelled like a campfire. But once we had driven out of it, we were greeted with incredible views all around us. There is a bit of smoke obscuring the mountains in this shot, but I think that it adds to the dreamlike quality of this scene. Beautiful photo. Makes me definitely want to visit. This entry was posted on October 11, 2008 at 9:10 am and filed under Glacier, Glacier National Park, Going-to-the-Sun Road, island, lake, Montana, mountains, National Park, Saint Mary Lake, sunrise, vacation, water, Wild Goose Island.